Samsung’s chip manufacturing arm is making the move from 14nm chips to 10nm processors. The company says it’s the first to begin mass production of system-on-a-chip solutions using a 10 nanometer FinFET technology. What does that mean for consumers? Smartphones, tablets, and other products that offer better performance, longer battery life, or both. Specifically, Samsung says the new chips can fit up to 30 percent more transistors into the same space, which allows for up to 27-percent better performance than a previous-gen chip (with all other things being equal), or up to 40 percent less power consumption. That doesn’t necessarily mean you’ll see phones with 40 percent longer battery life: other components including the screen and wireless radios can eat up a lot of power. And some device makers may opt to use smaller batteries to offer the same battery life in a smaller package. And of course, you won’t get 27 percent better performance and 40 percent lower power consumption at the same time. Most likely, chips made with Samsung’s new process will offer a bit of one and a bit of the other. It’s likely that Samsung will use the 10nm technology for upcoming Samsung Exynos processors. But Samsung also manufactures chips for other companies, so we could see the new process used in a variety of upcoming products. Samsung also says it’s already working on a 2nd-gen 10nm chip with better performance, scheduled for the second half of 2017. It’s all about the yield. If you can make a profit at 80% yield, start production. 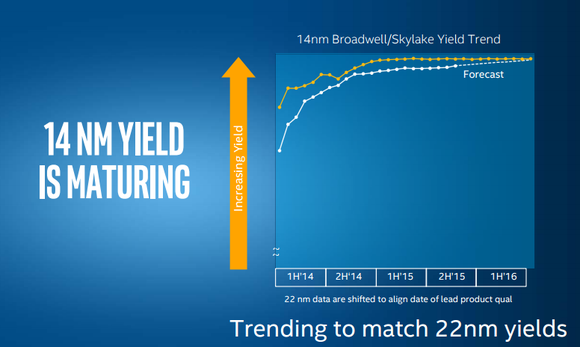 Here’s an example from Intel’s 14nm.. it can take years to hit high yields. Other companies actually work on a larger scale like Samsung, GlobalFoundaries and TSMC. So it’s possible they might not be as nimble as Intel, or barely holding unto their 16nm yields. In b4 rogue1 says something like “ARM needs 10nm to catch upto Intel Atoms”. He’s kinda right, but only for pure number crunching. A phone does that very rarely though, most of its life is spent asleep or keeping modems and sensors running on the smallest amount of power possible.